Situated right in the middle of the resort lies the Kamelia Hotel. 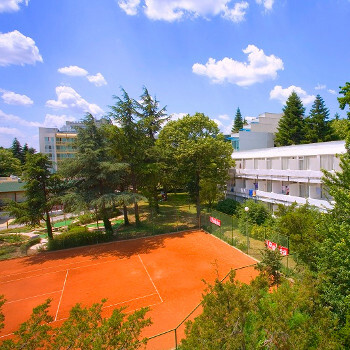 This 2 star hotel is next to the beach and makes a perfect base for your holiday to Albena. Me and my family stayed at the hotel kamelia in Albena Bulgaria. We have been to this hotel since I was 5 I am now 26. The hotel itself is small it doesn't have a swimming pool or a dining room. Just an open planned bar/reception area with dart board and two pool tables. You take your breakfast in the hotel next door which is buffet style. Its mostly targeted towards germans. You get a variety of food like cereal, eggs, sausage. Then a continental which is ham, and different cold meats, cakes, fruit, crossiants and different types of bread. Iif you dont feel like eating in the hotel next door the Kamelia does food. The rooms are very basic and small but the way I see it if you expect 4 star don't stay here. There is no entertainment. The rep is located in the hotel drouzba(next door). The bar is open 24 hours and its family run. They are very friendly so are the reception staff. The hotel is not on the main road but just outside you have the main street with bars and restruants. There are shops also on the main road too. The beach is just outside the hotel which is good for familys with children. They also have a water slide outside the hotel. Would I go back to this hotel hell yeah!!! !